Since I’ve been blogging for, gosh, over ten years now in various forms and at various URLs, I’m hip to the various ways to post and get information: blogs, rss, tweets, status updates, etc, and I long ago fell in love with a Mac application called NetNewsWire, one of the first best RSS readers. I’ve got thousands of website feeds in my subscription list and can skim them all in a manner of minutes if necessary. For me, however, NNW didn’t make the transition to iPhone app very well (I’ve had slow and buggy experiences with it). NNW was bought out by NewsGator several years ago and now syncs your lists between devices with Google Reader (this is a good thing). NNW for Mac is still a fabulous application and well worth an investment. But for staying connected with all the latest information while on the go, my new favorite RSS reader for iPhone is Reeder. The Reeder app is fast (even with thousands of feeds), has a pleasing minimal interface, and really killer functionality! It can take any interesting link and make a note, share it, post it to delicious, save it to instapaper (more on that in a minute), tweet it, open it in safari, and copy/mail links/articles as well. And more. The experience is, as I said, fast and sleek and simple yet with enough power to do whatever you wish. It, too, syncs up with your Google Reader account keeping everything up to date between devices. If you like a more glossy experience with your news and updates, you’ll want to consider using the new Pulse app, especially if you are mainly now using an iPad (it works the same on the iPhone, but the smaller screen makes it feel cramped). Pulse is a visually pleasing presentation of your feeds (but is limited to 20 of your favorites) so you’ll want to use it for the stuff you like to spend a little more time reading. For creating and catching up on your various tweet streams, I can highly recommend Twitterific for iPhone/iPad. There are plenty of other apps for tweeting (even one just for writing tweets, Birdhouse), but I’ve never felt lacking with the design or feature set of Twitterific. It just works, with multiple accounts, and it looks darn nice. The official Twitter iPhone app is nice, too, and free. On the desktop side of things, I’m a big fan of Seesmic. Others might recommend TweetDeck, but for me Seesmic fits my style and has all the expected features of multiple accounts, searches, hashtags, retweeting, URL shortening and the like. Works pretty well and the price is right (free). But lately, what with the multiple social media accounts that I manage or am involved with, I’ve desired something a little more powerful and found it in HootSuite. Because I’ve got my personal/business account (@tweak), my other business account (@viewville) and my feature film project (@triumph67film) as well as the various Facebook pages that go along with those, I needed a tool that could handle them all as well as do scheduled postings for future dates/times. 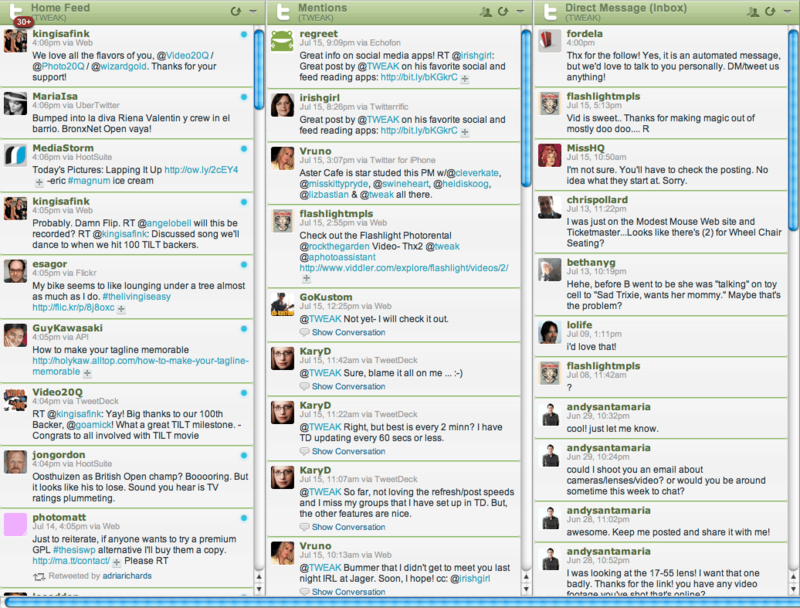 HootSuite does all this and more (including managing your other team members and assigning tweets to them)! And while their companion iPhone app does cost a few bucks (now free! ), having all those features in my pocket means I can more quickly and efficiently manage my various social media accounts when I’ve got a spare minute here and there. Oh, and instapaper. Well, this is one service you’ve just got to try. It’ll take your interesting links you come across and save them for later so you can flag a long story and have it all ready to go when you actually have the time to dig into a longer article. Simple, easy to use. PS – this entire post (and most of them, in fact) was created using MarsEdit.